When you think of India, you may not think of the beach. That, my friends is a mistake. If you are on vacation in India, or just have a couple of hours free, then visiting one of these beaches is a smart decision. 1. Radhanagar Beach may sound familiar even if you have not been to the region. 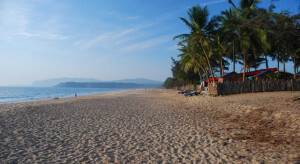 Time Magazine named it “Asia’s Best Beach”. What makes it so special? Located off of the Andaman Islands this beach has soft white sand, amazing turquoise-blue water clean of waves. So not only can you actually go into the water without being swallowed by waves, but you can also take lovely strolls up and down the shore without having rocks getting stuck between your toes. 2. Agonda Beach is a great destination if you are looking to relax. All-along its 3 kilometer shore are nice shacks so that you can get away from everything and just lay awake, out of sun, listening to the water, and living in your thoughts. Other than just chilling, visitors to this beach can also jump in to the water for a great swim, and of course get some great grub. If you are in a group, then renting a boat isn’t out of the question. 3. Varkala Beach is the same as Papanasm Beach. Situated on the Arabian Sea and part of the Indian Ocean. Papanasm, the nickname of the beach, means “wash away sins”, and hence it is said that a dip in the luxurious waters here will wash away all the sins of one’s life. Sounds great, no? 4. Benaulim Beach is for all of you sun-lovers. What makes this beach so special is not that it is the only one that gets sun, rather that folks flocking to the beach to lay on the sand unbothered can count on this beach to be just that. The untouched and nature-filled beach can still offer its visitors great food and no shortage of beer and cocktails. 5. Varca Beach is quite isolated with fewer beach shacks and shops than its neighboring beaches, but that is not necessarily a bad thing. If you want to be absolutely alone then there is no better beach. Most of the complaints regarding this beach are that is too quiet – so that is perfect for those of us looking to daydream. 6. Elephanta Beach is a beach for those that want to be active, as there is no shortage of activities ranging from great snorkeling to sea-walk. A plus – activities don’t start very early so there is no rush to wake up early. Of all the water sports and activities, it appears that the snorkeling comes with the best recommendations. Keep in mind that this is the ultimate Indian Beach for those that love the outdoors and being active. 7. Arambol Beach is your furthest north beach in Goa. Arambol beach tends to cater to not only your regular beach goers, but also to a new wave of “hipsters” that enjoy taking in the sea as much as all of us. There are no resorts or classy hotels on this shore which goes to show just how “local” you can feel while relaxing on this beach. Don’t fret though if you do want to get some gifts, as the locals have you set up with their custom works. 8. Palolem Beach is lined with towering coconut palms, and is home to some of the most beautiful beach shacks in India, and some could say that they are some of the best in the world. The unique layout of this beach and the great personality of the local people create a great atmosphere of relaxation, friendliness, and security. What can you do in between lying on the shore? Try yoga classes on the water, and even better a dolphin trip. Who doesn’t love dolphins? 9. Cola Beach can be described as a bit of paradise, rare treasure, and peaceful. The only down side may be getting to the beach by traveling through a 2 km bumby road. Once on the beach, there is no way for someone to complain. One word – dream. 10. Yarada Beach is a beach you most likely are not familiar with, unless you are a local in Vizag, due to the fact that other than the occasional bus, there is no transportation to the shore. If you want to work for your treasure then this is your destination, but due keep in mind that there is a small cost for entrance but that is for beach goers’ benefit. So do you want to visit 1 of these beaches?